Steve Englehart and Gene Colan set Dr. 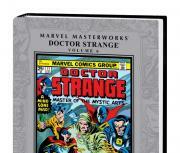 Strange on a series of unmatched classics in the Sorcerer Supreme's next Marvel Masterworks - and it all begins with the end of the world! Eternity declares that the end times are here - and to save us all, Stephen Strange must first face...himself. Next comes a Doc Strange vs. Dracula crossover, followed by a trip to Hell and finally a time-traveling Occult History of America! Then, Marv Wolfman takes the reins as Dr. Strange rejects his Sorcerer Supreme status - and must battle Xander the Merciless and a Clea gone mad! With lush and lyrical art by Rudy Nebres and P. Craig Russell, you'll find none more worthy of the name "Masterworks." Collecting DOCTOR STRANGE (1974) #10-22 and ANNUAL #1, and TOMB OF DRACULA (1972) #44.